BALTIMORE (CNS) — Though there were no actions on the U.S. bishops’ agenda in Baltimore dealing with immigration, poverty and other public policy issues, the president of their conference said Nov. 11 that he hopes to meet with President Barack Obama and House and Senate leaders soon on several topics. In a brief comment during the annual fall general assembly of the U.S. Conference of Catholic Bishops, Archbishop Joseph E. Kurtz of Louisville, Kentucky, said he had heard from many of his brother bishops about those issues and hopes to supplement the work that committees and USCCB staff are doing on such issues by conferring with the politicians. He told Catholic News Service that he intends to pursue a meeting with the president and the congressional leaders as soon as December. — Approved several liturgical items, including a revised translation of the ritual book used whenever a new church is built or when a new altar is made; the first official English translation of the ritual book “Exorcisms and Related Supplications”; and a supplement to the Liturgy of the Hours that is an English translation of the prayers used for the feast days of saints who have been added to the general calendar since 1984. — Voted in favor of a request by the USCCB’s doctrine committee to proceed with a revision of a section of the Ethical and Religious Directives for Catholic Health Care Services dealing with partnerships. — Endorsed the sainthood cause of Father Paul Wattson, co-founder of the Society of the Atonement in 1899 and in his day a leading advocate of Christian unity. — Approved a 2015 budget of just under $189.5 million. They also voted on a 3 percent increase in the diocesan assessment for 2016, but the vote fell short of the required two-thirds majority of the 197 members eligible to assessment increase in the assessment. Eligible members absent from the Baltimore meeting will be canvassed to determine the final vote. As the number of priests and pastoral ministers from other countries increases in the United States, he said the resource — now in its third edition — provides information for dioceses, eparchies and religious communities to prepare international pastoral ministers for their service and the communities that receive them. The USCCB’s four goals, or priorities, are faith formation and sacramental practice; strengthening marriage and family life; the life and dignity of the human person; and religious liberty. The bishops also heard a report on the work of members of a number of bishops’ committees — from pro-life, domestic justice and international justice to evangelization and religious liberty — who together are trying to pinpoint what Catholics in the pew are thinking and why they accept or disregard church teaching. The vast compilation of data is being assembled for bishops to read and also will be relayed in series of workshops. One of the major findings from the study — that Catholics want to find out more about their faith — has prompted plans for a 2017 convocation in Orlando, Florida, the week of July 4. With regard to the bishops’ ethical directives for Catholic health care, the focus of the revision is part 6 and the topic concerns “Forming New Partnerships with Health Care Organizations.” It will take into account principles suggested by the Vatican Congregation for the Doctrine of the Faith. During a question-and-answer period, bishops who spoke on the issue said they support the revision and noted the many complications that can arise in today’s health care collaborations. Once completed, the revision will be presented to the bishops for final approval. 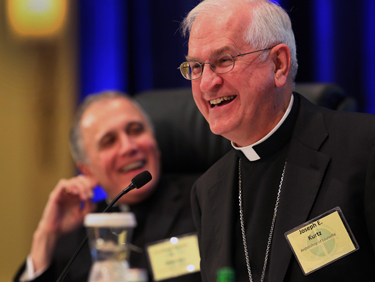 Bishop Richard J. Malone of Buffalo, New York, chairman of the Committee on Laity, Marriage, Family Life and Youth, invited the U.S. bishops to a 2015 Lay Ecclesial Ministry Summit. It will take place June 7, 2015, to mark the 10th anniversary of the bishops’ statement “Co-Workers in the Vineyard of the Lord.” It will be held just prior to the USCCB spring general assembly in St. Louis. In elections, Archbishop Gregory M. Aymond of New Orleans won the secretary-elect spot. The committee chairmen-elect who won are: Cardinal Timothy M. Dolan of New York, pro-life activities; Auxiliary Bishop Christopher J. Coyne of Indianapolis, communications; Archbishop Gustavo Garcia-Siller of San Antonio, cultural diversity; Archbishop Allen H. Vigneron of Detroit, doctrine; Archbishop Thomas J. Rodi of Mobile, Alabama, national collections. The first day’s agenda included reports on the recently concluded extraordinary Synod of Bishops on the family; Catholic education and an outreach to Hispanic students in underserved communities; the progress of planning for the 2015 World Meeting of Families in Philadelphia; the status of the 2013-16 USCCB strategic plan, “The New Evangelization: Faith, Worship, Witness”; the 2015 Fortnight of Freedom; and the defense of marriage. In his Nov. 10 report to the bishops, Archbishop William E. Lori of Baltimore, chairman of the Ad Hoc Committee for Religious Liberty, told the bishops the committee — extended for another three years — planned to focus more on teaching and expanding networks with Catholic lay groups and interfaith and ecumenical partners. He said threats to religious liberty remain a great concern. “The challenges to religious liberty with regard to the redefinition of marriage grow daily,” said Archbishop Salvatore J. Cordileone of San Francisco, chairman of the Subcommittee for the Promotion and Defense of Marriage, in his report. The Archdiocese of Philadelphia formally opened its arms to the world as Archbishop Charles J. Chaput of Philadelphia told the U.S. Catholic bishops that registration has officially begun for the World Meeting of Families next year in the city. 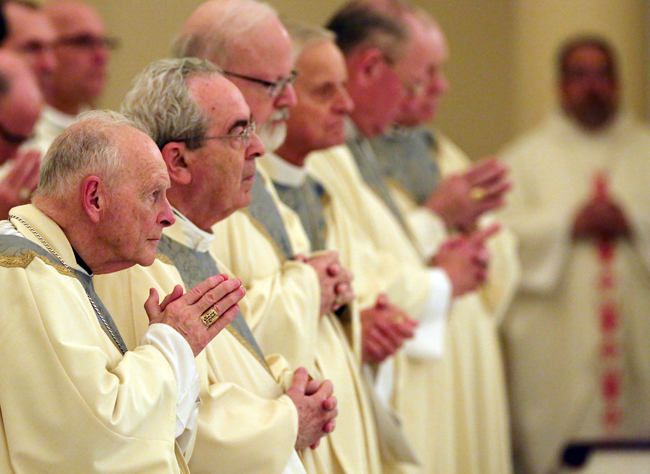 The first day’s business wrapped up by mid-afternoon, so the bishops could concelebrate Mass at the city’s Basilica of the Assumption of the Blessed Virgin Mary to mark the 225th anniversary of the establishment of the Archdiocese of Baltimore. Baltimore was the first diocese founded in the United States. Baltimore Archbishop William E. Lori said in his homily that all Catholics are heirs “to this precious legacy” set forth by the first nation’s first Catholic bishop — Bishop John Carroll. “Let us humbly ask for the grace to build on the foundations that John Carroll set down,” Archbishop Lori said. Contributing to this roundup were Patricia Zapor, Mark Pattison and Carol Zimmermann.